This is Part 5 of our Introduction to Lean Manufacturing Principles Series. Standard Work, Standardized Work, and Standardized Work Instructions all refer to Lean Manufacturing’s approach to documenting and following Best Practices for a particular manufacturing process which are subject to continuous improvement as new ways to eliminate waste are discovered. To “Standardize” in this context means to document well enough that we can be sure everyone can follow what we’ve decided at any given point in time is the Best Practice for the process. The documentation also includes data that can be analyzed in support of Kaizen (continuous improvement) and to settle disputes over improvements. Once you have data, you can try to the alternative and see whether the important metrics such as time or quality are improved. The goal is not the standard, its the process and its ability to support ongoing efforts at improvement (Kaizen). The standard is to be created by the people doing the work and not done top-down by management saying, “This is how the work must be done.” We’re not looking for inflexible autocratic procedures, we’re simply looking to document the Best Practice as it is understood at a particular point in time, and to improve it going forward. The documentation is there to help us to know, understand, and follow the Best Practices. – When should they do it? – How should they do it? What components might we need to assemble or what process do we go through before we can consider that Standard Work Instructions for the Manufacturing Process have been completed? 1. Observe the work before attempting to standardize it. Typically, a document called the “Process Study Sheet” is used to record the results of the observation. 2. 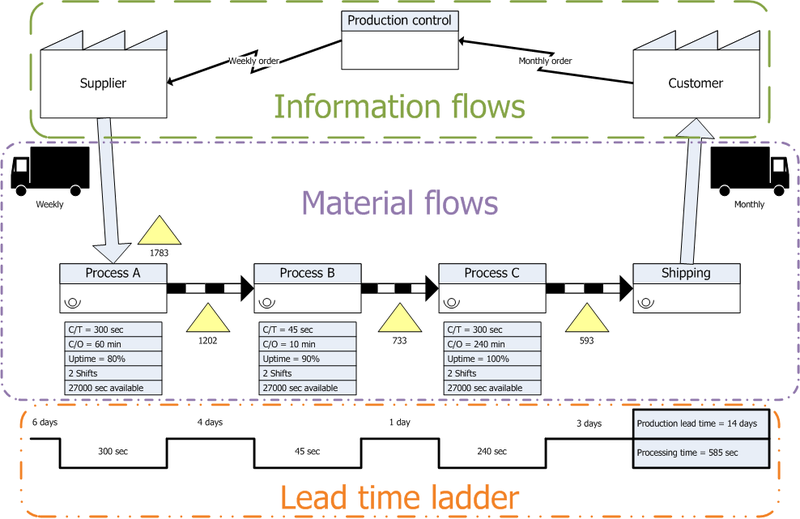 Takt Time and Line Balancing: An understanding of the required throughput in terms of parts per period of time to meet customer demand and an attempt to balance individual cycle times on the line to deliver that efficiently. 3. Work Sequence: Documenting the exact sequence of steps to be used for the process using a document often called the “Standard Work Chart”. 4. Standard in-process inventory: Documenting what the expectations are for Work in Process inventory. 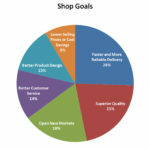 Lean Manufacturing seeks to minimize this inventory, so the goal is an inventory of 1 between each process. 5. Combination table: A graphical look at how the different process steps fit together. Let’s cover each of these ingredients in a little more detail. It should not be surprising given the goal of documentation that many of the ingredients involve creating documents with a standard format and purpose. 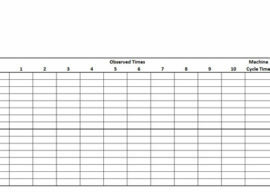 Print it from Excel or enter data directly into worksheets. The idea is to closely observe the manufacturing process, break it into its individual elements (each Process Step has multiple Work Elements) and record the information about times in each case. You should take multiple timings (the study sheet suggests 10) so you can average out the “noise” from the data. You may want to throw out the 2 longest times and the 2 shortest times and average the remaining 6 to arrive at your final timings. 1. You have to collect real times by observing the process–no estimating or guessing! 2. Make sure you can see what’s going on well enough. 3. Be sure to monitor an operator who is trained to do the job properly and is reasonably proficient. 4. Keep operator time and machine time separate. 5. Be courteous, both you and the operator have jobs to do and making these observations can be distracting for the operator and tedious for the observer. But it’s necessary homework to get done. Armed with your Process Study Sheet and its data, you’re ready to look into Takt Time. Takt time for this purpose is the time it takes to produce one part. For example, if you have to produce 25,000 parts in 2 weeks, you can do the appropriate calculations to figure out how many parts each shift must produce and how long a shift has to produce each part that rolls off the assembly line. Be sure to take into account producing parts in batches since each setup on a machine may produce many parts. Takt Time is quite different from Cycle Time. Takt Time reflects demand or pull. It is the time available divided by the parts that must be produced in that time. Cycle Time is about capacity or push. The Cycle Time requires x time to product y parts. The Takt Time requires x parts to be produced in y time. The goal is to achieve Takt Time but the Cycle Time is what we’re actually capable of at a given point in time, so there is often tension between the two when the Cycle Time is longer than the Takt Time (implying we can’t keep up with demand). Knowing the Takt Time for a part, you can look into Line Balancing. 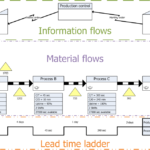 You’ve got the data on how much time each process takes in your Process Study Sheets, and you know what is required in terms of Takt Time, the question is how do you balance all of the steps required to produce a part to get it done in the required Takt Time? The chart shows the result of running each process at full capacity for 1 hour. Perhaps the first process is cutting rough stock, the second is machining, and the third is deburring or some such. What happens is the first process produces 360 parts, only 60 of the 360 get through the second process (so the output of the first is piling up), and as a result, even though the 3rd process could produce 240 parts, it is starved and only manages to output 60 since that’s all it gets out of the 2nd op to work on. By trying to make the time for each process as equal as possible, we minimize the chance of starvation or over-production piling up. All other things being equal, we need to shift time out of the 2nd Op and into the 1st and 3rd Ops. Or we may want to break the 2nd Op down into multiple sub-operations. One example of reducing time for the 2nd op might be to move a tapping operation downstream to the 3rd op, perhaps with a tapping arm instead of using the CNC machine to do the work. Sounds counter-productive, but if you have idle operator time they could very well be tapping holes with a tapping arm and reduce the overall cycle time for the 2nd op. Another example could involve moving tool setting operations off the machine and onto an offline Tool Presetter. There are tradeoffs here, and we want to be mindful that automated time with the machine doing the work is often cheaper and higher quality than using more operator time. Rather than shift time from a machine to an operator, it may make more sense to shift it to another machine such as a 2nd op machine. Or to split manual tasks among more workers so that the line becomes more balanced. Line balancing also ensures no single person or role is overloaded and overworked versus the others. 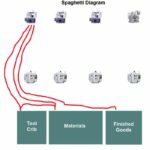 There is more information and detail in a VSM than is probably needed for a Standard Work Chart, but I like the idea of using the VSM to assist in this role since you likely want to produce them for Kaizen purposes anyway. Being able to start from one that documents the process is valuable. OTOH, the two are often at different levels. A VSM may be fairly high level (it doesn’t have to be) while the Standard Work Chart needs to get down to the level the operators need to understand the process they’re implementing, so it has to reach down to low level details. The other document that is valuable at this stage is the Standard Job Instructions. It’s a textual accompaniment, usually as a check list, that goes with the flow diagram to document the process. Ideally we will want to hang printed copies of both in each work cell so they can be referred to. It is helpful to make sure the Standard Job Instructions are focused on the tasks of each work cell. 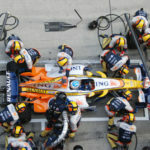 We can document the overall process with the collection of all the Standard Job Instructions across all the work cells. One last major point to consider on documenting the process–it needs to contain the information and steps necessary to understand whether the process succeeded or failed. Quality Control tests and expectations as well as throughput expectations are essential to document and include in the process. We want to understand, quantify, and document the in-process inventory. As a rule, Lean Manufacturing tries to minimize Work in Progress because it views it as waste. Letting WIP stack up between process steps is to be avoided and minimized. Before we can understand and improve on a thing, we must first measure it, document it, and establish baseline expectations. With that foundation, we can attempt to improve on it. As mentioned, the goal of Lean Manufacturing is the minimization of Work In Progress, because it leads to waste. Most treatments speak of getting WIP down to 1. There are some subtle points to consider here. For example, the ideal of “1” may refer to lot size rather than 1 single unit of a part. You wouldn’t take a great fixturing job that made maximum use of a machine’s travels to fit 20 parts on the table and throw it away for 1 part in the vise just because you didn’t want 20 parts in WIP inventory. OTOH, your work on Takt Time and Line Balancing might lead you to believe it wasn’t worth constructing a fancy fixture like that if other processes couldn’t keep up with the throughput needed either to supply the process or absorb its output. Another issue is the need for additional inventory to flow through to accommodate mistakes. The goal of any Quality program will be to eliminate the root causes of those mistakes and hence to minimize them, but until we achieve perfection, there will be some scrap rate that has to be accounted for. Another area to think about are the requirements for inventory at the beginning and end of the process. You’ll want to understand and document how much raw material needs to be on hand and how often it needs to be re-ordered as well as how much space is requirement and the logistics of shipping out the finished product at whatever intervals and quantities the customer requires. To summarize, the goal of this step is to document the in-process inventory size for each step of the process. We’ll know if there are problems if we see that inventory growing too large at a particular stage. The Work Combination Table gives us another way to visualize the process so we can understand it better, implement it properly, and potentially improve on it. So this is simple–management decrees everyone document the processes according to the descriptions above and we’re done, right? 1. Do the Kaizen continuous improvement step first. It helps tremendously if people feel empowered to improve processes. Moreover, a lot of the documentation work can be a part of the Kaizen process as well. Standard Work and Kaizen are like the two sides of the same coin. Give your employees more control through Kaizen and they’ll be more likely to want to see their great new ideas followed through Standard Work. Use the Kaizen vehicle to create an atmosphere of engagement, involvement, ownership, and most of all entrepreneurship where everyone feels like they have a stake in improving the business. 2. Instead of demanding compliance and punishing non-compliance, treat compliance as a process to be continuously improved too. When you discover someone is not following the Standard Work Instructions, ask them, “Why not?” Seek answers that uncover why the employee feels their way is better or that the Standard Work was too hard. Work on improving the Standard Work, training, messaging, and resources, to address the issues that led to non-compliance. This shows that compliance is too important to merely be a matter of following orders and that it’s worth getting it right so it is obvious to everyone why they need to follow the Standard Work. 3. Get used to the idea that as a process, compliance is never complete and never finished. There is always opportunity for improvement and the more you focus on facilitating improvement, the better things will get. 4. Delegate, coach, and get people to think for themselves. The next installment in our Lean Manufacturing Principles Series is about SMED, which is Lean Manufacturing’s approach to reducing Setup Time.